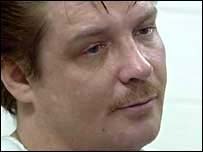 Death row Scot Kenny Richey has missed a court hearing that would have set him free from more than 20 years in prison after he fell ill.
Richey, originally from Edinburgh, was taken from Putnam County Prison to a nearby medical centre prior to his court appearance. 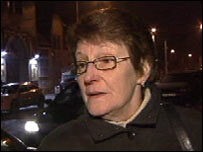 He had been expected to enter a plea which would have allowed him to walk free and return home for Christmas. But the Scot was rushed to a medical centre suffering from chest pains. His lawyer said he took a bad reaction to medication he has been taking for a pre-existing heart condition. He also suffers from high cholesterol and diabetes. Richey was hoping to be freed on Thursday following a deal with prosecutors. It was the latest development in a long-running legal battle following his conviction in 1987 of an arson attack which killed a two-year-old girl. Richey has always maintained his innocence. He had been due to plead no contest to attempted involuntary manslaughter and child endangering - a move which would have triggered his release from prison. According to his lawyer, Richey's flight back to the UK had already been booked. However, he is currently receiving treatment at St Rita's medical centre in Ohio. His court hearing has now been re-scheduled for Tuesday, 8 January. Speaking earlier on Thursday, his mother Eileen Richey said she was "happy beyond belief" at the news of his pending release. Ms Richey, who still lives in Edinburgh, said: "Firstly can I thank the many people who have supported Kenny in his fight for justice and freedom. "Things happen in such a rush and as yet I haven't been able to speak to Kenny. "Obviously I am happy beyond belief that his long imprisonment is almost over. "But because of false hopes that have been raised in the past, I don't think that I'll be able to believe my son is finally free of the torment he has endured for more than 20 years until he is back home here in Edinburgh with me. "I am his mother and it is my duty to ensure that he experiences as smooth as possible a transition to normal life again." Richey was put on death row in January 1987 after being convicted in Ohio of starting a fire in which two-year-old Cynthia Collins died. Prosecutors claimed he began the fire as a jealous attack on his former girlfriend and her new lover, who lived in the flat beneath. Richey, who has always protested his innocence, refused a plea bargain which would have led to an 11-year sentence for arson and manslaughter. On 10 August the Cincinnati Court of Appeal overturned the Scot's sentence. He was moved from the notorious Mansfield Correctional Institution in Ohio in September to the low-security Putnam County Prison.